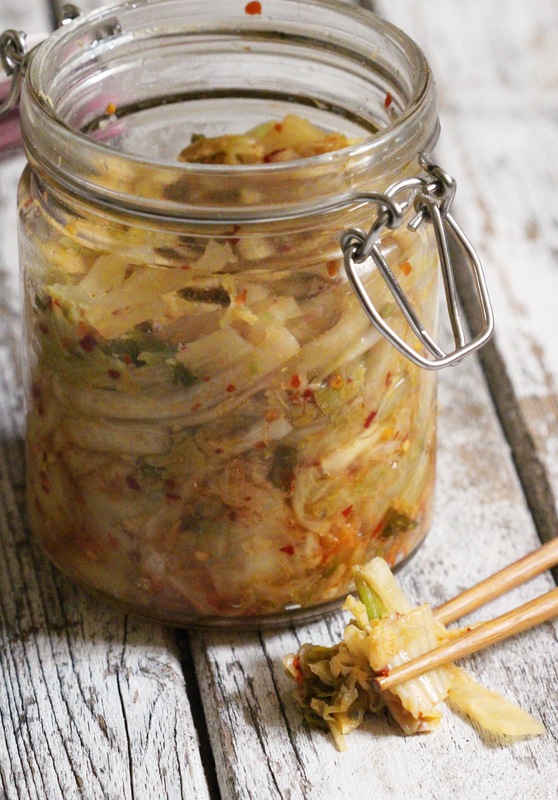 Kimchi is one of those love it or hate it foods, if you love it it’s so addictive. If you’re not quite sure what Kimchi is it’s a traditional Korean side of seasoned fermented vegetables. 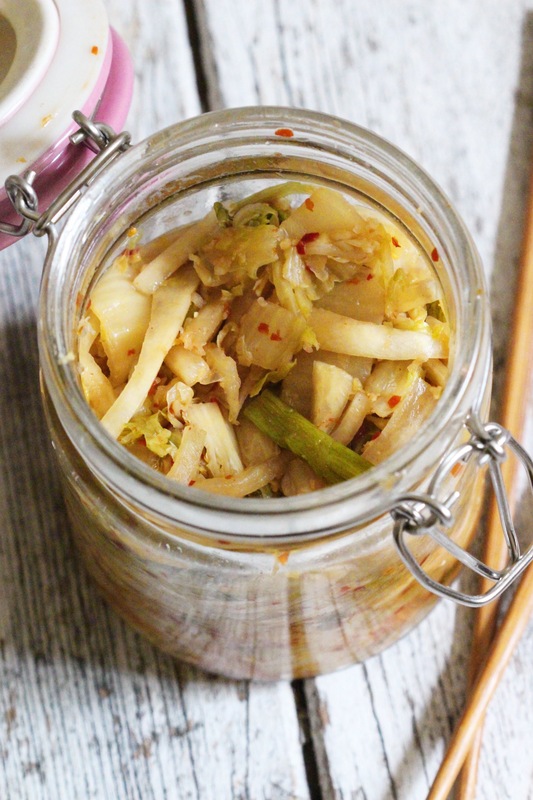 I’m completely addicted, which is great because fermented foods are amazing for your gut and digestion thanks to all the beneficial enzymes, b-vitamins, Omega-3 fatty acids, and various strains of probiotics created during the fermentation process. It’s gorgeously crunchy, perfectly spicy and has a certain je ne sais quoi, which makes it so moreish. I often have it with my dinner in non-traditional pairings, whenever you need some added crunch and spice it hits the spot. This is my super easy, go-to version. Cut the cabbage in half lengthways and then cut it into sideways into strips. Add it to a large bowl with the salt. Use your hands to massage and squeeze the salt into the cabbage until it softens a little. Cover it with cold water, then place a plate on top followed by something heavy to weigh it down. I use a big jar of nuts as my weight. Leave to sit for 2 hours. Mince the garlic cloves and peel and grate the ginger, add them to a small bowl with the coconut sugar and water and mix. Add in your chili flakes, depending on how spicy you want it, I use about a tablespoon as I like it quite hot. Peel the daikon and then cut it into thin match stick like strips. Cut the ends off the spring onions and then cut them into thick slices (if they’re very thick, cut them in half lengthways first). When the cabbage is ready, drain it in a colander and rinse well, then squeeze any remaining liquid out of it and add it to large bowl. Add in the daikon and spring onion and then the paste. Mix well. Add it all to an airight jar and press it down tightly letting the brine rise to cover all of the vegetables. Make sure there is a little space between the brine and the lid. Seal it and let it sit for 2-5 days, depending on how long you have, then open it to release the gas, reseal and pop it in the fridge- you can eat it from now on but it’s best with another few days in the fridge.